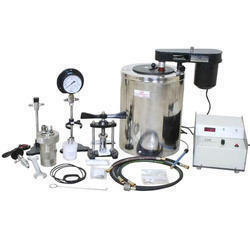 We are a leading Manufacturer of bomb calorimeter apparatus, model mic145 from Ambala, India. It is used for determination of calorific value of liquid & Solid fuels. The Instrument consists S.S. Body made out of corrosion resisting stainless steel Rod cap. 300 ml, Calorimeter vessel, outer Jacket with insulated Body, offset stirrer, S.S. Crucible, pellet press, ignition wire, and pressure gauge, with flexible pipes, with electronic firing unit. Looking for bomb colorimeter ?